A chartered flight from Taiwan arrived for the first time since March 11 at Fukushima Airport, carrying tourists who will spend their vacations in locations inside Fukushima Prefecture. I don't understand why they do it; my best guess is that they just couldn't pass up great bargains to be had in Fukushima. It could be the bargain that they didn't even need to pay for the trip. The first chartered flight since the March 11 earthquake and Fukushima I Nuclear Power Plant accident arrived in Fukushima Airport. Regular international flights to and from Fukushima Airport haven't resumed, due to the restrictions placed by foreign countries for the fear of radiation contamination. Fukushima Prefecture has been requesting the resumption of the international flights to the international airlines in foreign countries and regions, and November 19's flight is the first result of the effort. However, according to the tourism section of the Fukushima prefectural government, the next flight is not scheduled. The air radiation level at Fukushima Airport, 60 kilometers away from the nuclear power plant, is low, between 0.1 and 0.2 microsievert/hour. As far as the Japan National Tourism Organization (JNTO) knows, twelve countries and regions continue the travel restriction to Japan. Taiwan, from which the charter flight to Fukushima today was originated, recommends "evacuation from Fukushima Prefecture". The tourists came at their own risk. Japan is looking toward China as the growth engine for international tourism, but China continues to maintain the recommendation not to visit the areas seriously affected by the disaster. The Japanese government has been working on the foreign counterparts to loosen the travel restrictions, but so far received "no favorable response", according to JNTO. Since when 0.1 to 0.2 microsievert/hour became "low radiation" level? It used to be 0.03 to 0.06 microsievert/hour in Fukushima before the accident. JNTO has a website specifically targeting Taiwanese tourists, and has been heavily promoting Tohoku region including Fukushima. Japanese Researcher: "Reactor 2 Suppression Chamber May Have Been Damaged in the Earthquake"
The researcher, Fumiya Tanabe, is the same one who also said back in August that the fuel of Reactor 3 had melted twice and dropped onto the Containment Vessel. If what he says is true that the Reactor 2's Suppression Chamber broke during the earthquake, it may have grave implications for all the other nuclear reactors in Japan with the same earthquake specifications. 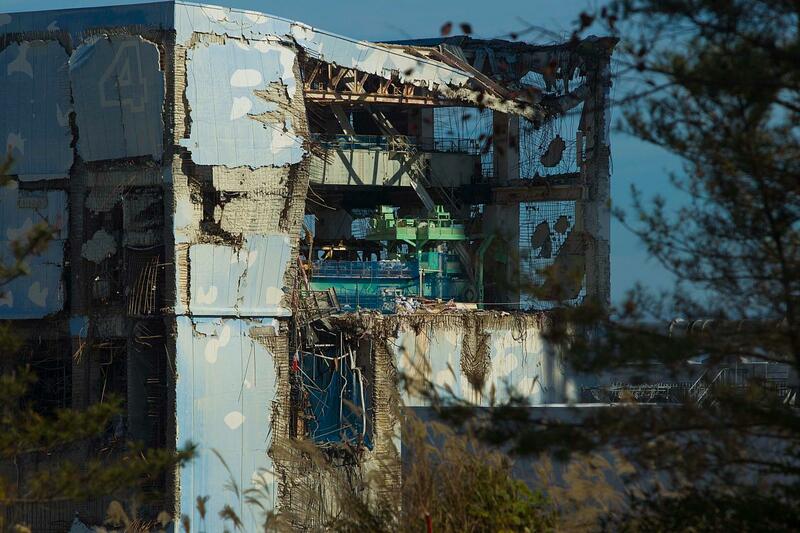 Reactor 2's building exterior is pretty much intact, with only one hole on the side of the building. Yet, the NISA's estimate shows this reactor may have released more radioactive materials than the other reactors (1 and 3). If the Suppression Chamber was broken as soon as the earthquake hit on March 11, that may explain it. An expert in nuclear safety complied the result of the analysis by November 19 that shows the high possibility of the Suppression Chamber of Reactor 2 at Fukushima I Nuclear Power Plant having been damaged or degraded by the earthquake. TEPCO still maintains its position that there was no visible damage to the reactors by the earthquake, and the cause of the accident was the loss of power because of tsunami. If the reactors were damaged by the earthquake, it would affect other nuclear power plants in Japan whose anti-earthquake standards are the same as those of Fukushima I Nuclear Power Plant. A closer look at the result of investigation by TEPCO and the fact-finding committee of the national government would be warranted. The researcher who did the analysis is Fumiya Tanabe, a former researcher at the Japan Atomic Energy Agency (JAEA) and the current head of the Research Institute on Safety of Technology Systems (my translation, and not the formal name of the organization; 社会技術システム安全研究所) in Hitachinaka City in Ibaraki Prefecture. I am trying to locate the details of his findings. The ASEAN meeting in Bali, Indonesia is being covered widely in Japan, as the Noda administration has expressed its extreme willingness to join the TPP (Trans-Pacific Partnership) pushed by the US administration. The TPP is a regional so-called "free-trade" agreement whose ultimate purpose seems to be the isolation of China in the region. Watching the TV coverage of the ASEAN meeting, some Japanese are surprised to see what they perceive as "bad manners" by President Obama - chewing gum constantly, even in front of the cameras and during the face-to-face meeting with the Chinese premier. Crossing legs is not looked on very well either. You can view President Obama chewing gum at ASEAN meeting at NHK News (11/19/2011). Click on the screen on the left side for the video. It must be the nicotine gum, I assume. And no one in his entourage to caution the president. A US president who chews gum in an international conference? I wrote on Monday November 14 about the paper by the international team of scientists on cesium-137 deposition simulation after the Fukushima I Nuclear Power Plant accident, from March 20 to April 19. In the English paper that I linked, there was a map of cesium-137 deposition simulation in much wider area of Japan, which I showed in the post. Looking at the map, I don't think I want to eat anything from the Pacific Ocean. Or the Japan Sea. Abalone fishing just started in Iwate Prefecture. By the way, the paper and the researchers were criticized heavily on Twitter a couple of days ago (it still continues) from other researchers in Japan. Their beef was that the researchers of the paper withheld this information from the public when it could have made the difference in determining the government policy or in alerting more people on the possibility of much wider radiation contamination. Instead, the researchers waited for the peer review in the very prestigious scientific venue (the National Academy of Sciences of the United States) to be finished and the paper published. Some say the researchers had the temerity to say in their Nagoya University press release on November 15, "We request that the information in the paper not be used to spread a new set of "baseless rumors" [on the contamination]." Well, as we have seen, they are not alone. There have been a lot of Japanese researchers who have done what they just did, announcing what could have been the vital information after their papers got accepted by foreign peer-reviewed magazines. I personally know one, whose radiation survey result in locations in Fukushima might have made a significant difference. But the researcher is still sitting on the data (though he was careless enough to put it on his website for a long time), because his paper is being peer-reviewed. But then there are researchers like Professor Yukio Hayakawa of Gunma University, who released the radiation contour map he created soon after the accident, to much ridicule from the establishment initially. And Professor Bin Mori of Tokyo University, who published his world-first discovery of bio-concentration of radioactive silver in spider on his personal blog, and allowed me to spread the information both in Japanese and in English so that more people know about it as soon as possible. Well, Professors Hayakawa and Mori have the professorship, and these researchers do not. Still it is too bad that they had to put their careers before the welfare of the population in Japan. The young king of Bhutan Jigme Khesar Namgyel Wangchuck and his 21-year-old queen Jetsun Pema Wangchuck, whom he married in October, have been in Japan as the first national guests after the March 11 disaster. On November 18, they visited Soma City in Fukushima Prefecture and talk to children in an elementary school. The king talked about a "dragon" in everybody's heart. Children were ecstatic. Bhutan is a "country of dragon". East of today's Iraq, a dragon is associated with power, majesty, and nobility. Total opposite of the west. The king would be horrified at Siegfried killing the dragon. There's a dragon in each and every single one of us. Dragons feed on experiences. It becomes stronger and stronger over the years. We must always be in control of that dragon. He told the children to be strong, and feed the dragon inside them. Afterwards, one of the children said, "I am so excited. He shook my hand, and I'm not going to wash it." The king, devout Buddhist, performed a ritual of consolation for the dead at a location in the city where the tsunami swept off everything. There are many on the net who expressed dismay that the Japanese government is using the young royal couple as another PR ploy that Fukushima is safe. One TV station (I don't know which one) apparently said in the morning news that this was all good, because it proved to the world that Fukushima was safe to visit, even for royals. He and his wife are clearly touching the hearts of many Japanese, though their visit is not that widely publicized in the media, except for the visit to Fukushima. I hope his country is set to receive tremendous amount of money and aid from Japan for his kindness. (UPDATE) The said Hungarian Institute says "It's not us." "If the source of heightened radioactivity had been Budapest, the levels measured here should have been much higher." 17 November 2011 | The IAEA has received information from the Hungarian Atomic Energy Authority (HAEA) that the source of the iodine-131 (I-131) detected in Europe was most probably a release to the atmosphere from the Institute of Isotopes Ltd., Budapest. The Institute of Isotopes Ltd. produces radioisotopes for healthcare, research and industrial applications. According to the HAEA, the release occurred from September 8 to November 16, 2011. The cause of the release is under investigation. As previously mentioned, the levels of I-131 that have been detected in Europe are extremely low. There is no health concern to the population. If any member of the public were to breathe iodine for a whole year at the levels measured in European countries, then they would receive a dose in the range of 0.01 microsieverts for the year. To put this into perspective, the average annual background is 2400 microsieverts per year. The IAEA was first notified of the presence of trace levels of I-131 by authorities from the Czech Republic on 11 November. Since this notification, the IAEA contacted several member states throughout the region to determine the cause and origin. The IAEA also worked with the World Meteorological Organization (WMO) to conduct air dispersion modelling, as part of efforts to determine the source. At least IAEA didn't mention X-ray or transcontinental flight. Never mind that the average annual background includes external radiation, and that iodine-131 goes almost exclusively to thyroid; talking about the whole body radiation is irrelevant. Yomiuri Shinbun may have made a fool of itself by summarizing the finding by a university researcher regarding the biological half-life of radioactive cesium in a very exaggerated (and inaccurate) way. If you read the article, it's rather embarrassingly clear that "wild animals" are lab mice, and "eating contaminated food everyday" is drinking cesium-laced water only once. It is possible that the researcher's paper made a connection between a mouse and a wild animal, and drinking water once and eating contaminated food every day, and Yomiuri Shinbun, in its eagerness to bring the good tidings to the general public in Japan, omitted the connection in the article. Oh well. Many of my Japanese twitter readers who read the article are saying, "What can you expect from a pro-nuke newspaper like Yomiuri?" or "Gomiuri (garbage seller)?" Hiroo Nakajima of Osaka University has found that there is a high possibility that a large amount of radioactive cesium-137 ingested by wild animals right after the Fukushima I Nuclear Power Plant accident may halve every 1.5 years, falling to one-eighths after the first 5 years even if the animals keep eating the food around the nuclear power plant. It will provide a clue to the internal radiation exposure of wild animals and people in the areas near the plant. His research was published in the meeting of the Japan Radiation Research Society in Kobe City on November 17. Nakajima fed mice with water with cesium-137 whose half life is about 30 years (1 kilo-becquerel/1 gram of live weight, or 28 kilo-becquerels per mouse) once, and studied the amount of cesium remaining in the body over time. In most organs such as heart and kidney, the amount of cesium peaked right after ingesting the water. However, it dropped to one-25th in one week, and to one-120th in 2 weeks. These wild animals (eh... mice) are likely to have been eating contaminated food and drinking contaminated water ever since March 11. So did people, like villagers in Iitate-mura or town folks in Namie-machi, for quite some time after the March 11 accident. They ate the vegetables they grew, and drank water from their wells, on assurance from the experts like Dr. Yamashita. #Radiation in Japan: "Blowing in the Cold Autumnal Wind"
Everyday I get up in the morning hoping that people in Japan will wake up to the dire situation they are in and start doing something. Anything. Everyday I am disappointed. When they do something, it is almost always "WTF....?" Yesterday was no exception. Here's a collection of small news in Japan from yesterday that made me recite the haiku by the master Matsuo Basho - "When I say something, as soon as the word leaves my lips, it's blowing in the cold autumnal wind" - there's no use in saying. I suppose it's their way of getting back, in a way. The Mayor of the city, when he visited a city in Kyushu, couldn't help commenting on the bitterly-fought civil war of almost 150 years ago in which his city under Lord Katamori Matsudaira lost to the forces that included the lord of that city in Kyushu. The Kan administration sent SDF soldiers to Fukushima I Nuclear Power plant right after Reactor 1 blew up. They were taking up positions for the watering operation on March 14, when Reactor 3 blew up. Some warm feelings between the government and the SDF. It's not even the decontamination of people's houses or farmland. The SDF soldiers will be made to decon the municipal buildings that even the town's politicians are not very keen to return to. Who are these general contractors heading these JVs? Kajima, Taisei, Obayashi (Asahi Shinbun 11/15/2011). In other words, the same ones that have profited from building nuclear power plants and other big government infra projects, and some of the same ones who are getting disaster debris burning jobs in Miyagi Prefecture in a blatant case of collusion "dango". Fukushima Minyu (11/17/2011) tells us that the residents in the 3-kilometer radius from the plant in Okuma-machi started to return temporarily to retrieve their belongings. They are allowed to use their cars. I am sure the cars will be decontaminated at the check point or at J-Village. The problem is that since the background radiation is high, the cars may test perfectly fine there. Why do they do this? Because 1) they did it last year about the same time; 2) to show to the rest of Japan what a wonderful place Fukushima is, how people are coping wonderfully, how it is safe to hold an event like this. To do the Number 2, what better way than to use 13, 14 year olds? Someone in Fukushima City send two boxes filled with contaminated soil to the Ministry of the Environment. A General Affairs section manager expressed his feeling that it could be buried in his backyard, so the worker under him took his meaning and took the boxes home, dumped the content in an empty lot in the neighboring city. As usual, he lies. 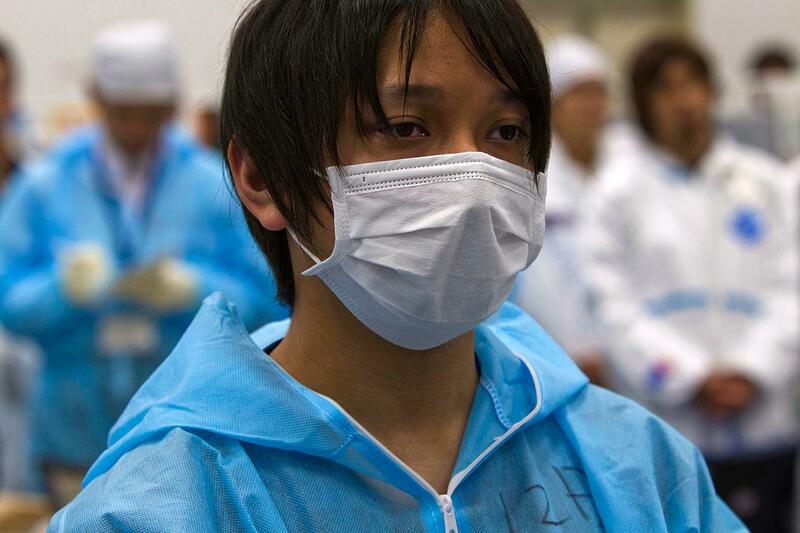 Fukushima City's decontamination is to be done by the city, who is busy rounding up volunteers. The city is not designated as any type of evacuation zone, and it is 60 kilometers away. So it's outside the government responsibility to decontaminate. As the country slowly descends into lunacy, winter comes, and cold, north wind will blow from Fukushima's direction to Kanto and Tokyo. For more, see my previous post. But here's the video of Packbot working at the 1.32 sievert/hr (or 1320 millisieverts/hour, or 1,320,000 microsieverts/hour) location in Reactor 3's reactor building where the human workers somehow will have to go in. The video is from the November 12, 2011 press tour of J-Village and Fukushima I Nuclear Power Plant, first since the accident. The members of the press were limited to those who belong to the press club and the foreign correspondent club. For those of you who wrote to me that Fukushima rice was "safe" because it all "tested" well below the safety limit of 500 becquerels/kg of radioactive cesium, sorry. NHK has a piece of bad news for you. 630 becquerels/kg of radioactive cesium has been detected from the rice grown and harvested in Onami District of Fukushima City in Fukushima. It was discovered only because one farmer asked the local JA to test his rice. The video clip accompanying the NHK News says 630 becquerels/kg of radioactive cesium from brown rice, and 300 becquerels/kg from white (milled) rice. The entire Onami District was declared good to ship the rice, after the Fukushima prefectural government tested 2 samples in one location in Onami District. It has been revealed that 630 becquerels/kg of radioactive cesium, exceeding the national provisional safety limit, was detected from the rice harvested in a location in Onami District of Fukushima City [in Fukushima Prefecture]. Fukushima Prefecture has requested the farmers in Onami District to refrain from shipping this year's crop. According to Fukushima Prefecture, a farmer in Onami District of Fukushima City asked the local JA (agricultural co-op) to test his rice harvested in one of his rice paddies for radioactive materials. In a simplified test administered by the JA, radioactive cesium exceeding 500 becquerels/kg was detected which exceeded the national provisional safety limit. Fukushima Prefecture then tested again, and 630 becquerels/kg of radioactive cesium was detected from the brown rice. The farmer has about 840 kilograms of rice harvested, but it is not being sold in the market. Upon receiving the test result, the Fukushima prefectural government requested all the rice harvested in Onami District of Fukushima City, including that of this farmer, to be not shipped this year. In the "main survey" that Fukushima Prefecture conducted last month to measure radioactive materials in rice, two locations in the former Oguni-mura in Onami District were tested. Radioactive cesium detected there were vastly below the national provisional safety limit, at 33 becquerels/kg and 28 becquerels/kg, and the prefectural government allowed the shipment from the entire district. The Fukushima prefectural government plans to conduct a detailed survey of [the rice harvested in] all 154 farms in Onami district, and investigate the cause [of high radioactive cesium content]. Well, the cause is Fukushima I Nuclear Power Plant. The governor of Fukushima Prefecture, the "world-famous" Yuhei Sato, had declared Fukushima rice to be "safe" and vowed to mount an aggressive PR campaign to promote the rice harvested in Fukushima throughout Japan. Koriyama City in Fukushima Prefecture, also with high radiation contamination, has started to feed school children with locally grown and harvested rice. where the carbon-based workers would have to go in to install the gas management system, which would filter the gas coming out of the Containment Vessel to capture radioactive materials and release it outside. One minute of work at that location would get a carbon-based worker over 21 millisieverts radiation. One second 360 microsieverts. As I said before, a futile window-dressing, as the CV have been breached somewhere already. It is absolutely crazy, bordering criminal, to send workers there for a cosmetic, token work. TEPCO announced on November 16 that 1,300 millisieverts/hour [or 1.3 sievert/hour] radiation was measured in the northeast corner of the reactor building 1st floor of Reactor 3 at Fukushima I Nuclear Power Plant. It is the highest radiation level so far measured inside the Reactor 3 reactor building. On November 14, a robot wiped off the water on the rail that is used to move the concrete door of the Containment Vessel [of Reactor3], and detected the radiation at 10 to 20 centimeters off the floor. The robot was sent in to prepare for the work to install the "gas management system" that would clean the gas inside the Containment Vessel and release the cleaned gas into the atmosphere. TEPCO's Matsumoto said, "It is possible the pressure inside the Containment Vessel rose after the accident and that radioactive materials leaked". In the reactor building of Reactor 1, over 5,000 millisieverts/hour [or 5 sieverts/hour] radiation was measured in August. As to more than 5,000 millisievert/hour radiation in Reactor 1, we were never told how much "more than 5,000". Governor of Tokyo Shintaro Ishihara is ready for more "disaster" radioactive debris from Tohoku. After having started on Iwate's debris and scolded the residents to shut up and put up, he is eager to sign the deal with Miyagi Prefecture and bring in Onagawa's debris to Tokyo to crush, burn, and dump in the landfill in Tokyo Bay. Reading the Mainichi article linked below, it is clear that the Tokyo government is going to circumvent the pesky residents completely by running the idea of accepting disaster radioactive debris with the Assembly of Special Ward ("ku") Mayors. There are 23 of these mayors, and as long as they're OK (they seem quite eager to help out Miyagi and Iwate for some reason), Ishihara will just do it. The Tokyo residents and the Metropolitan Assembly will be bypassed. To remind you, the company who will do the incineration and burying the ashes in the landfill is Tokyo Rinkai Recycle Power, a TEPCO subsidiary receiving subsidies from the Ministry of Economy, Trade and Industry and the Ministry of the Environment and sweetheart land deal with the Tokyo Metropolitan government. Perfect regulatory capture. Regarding the slow progress of wide-area processing of the disaster debris from the March 11 earthquake/tsunami, it has been revealed that the Tokyo Metropolitan government and the Assembly of the Special Ward Mayors have been discussing the acceptance of disaster debris from Onagawa-machi in Miyagi Prefecture. The formal decision may be made by the end of this month. If Tokyo accepts the debris from Onagawa, it will be the second such case since the debris of Miyako City in Iwate Prefecture. According to the secretariat of the Special Ward Mayors, they have been discussing the acceptance of flammable plastics since October at the request from Miyagi Prefecture. The disaster-affected areas have debris that exceed the areas' capacity to process, but concerns of radiation contamination has so far prevented the wide area processing outside Tohoku. The Secretariat of the Special Ward Mayors says, "If there is no place that would accept the debris, there will be no recovery for the disaster-affected area. We would like to listen to the residents [of Special Wards] and decide." If the Assembly of the Special Ward Mayors agree, the Tokyo Metropolitan government plans to sign an agreement with Miyagi Prefecture. The Tokyo government signed the similar agreement on September 30 with Iwate Prefecture, and has announced that 500,000 tonnes of debris from Iwate and Miyagi will be accepted in Tokyo in two and a half years until March 2014. Listening to the residents is as democratic as listening to the residents when a nuclear power plant is being planned; the meetings will be filled with government shills who will support the idea while expressing some concern for the safety. A farce. On November 15, the Ministry of the Environment announced the result of the survey of the radioactive material density in bottom soil in 193 locations in rivers, lakes and dams in Fukushima Prefecture. Radioactive cesium was detected in almost all locations, with the highest density of 60,000 becquerels/kg of radioactive cesium in the riverbed soil in the Ota River that runs through Minami Soma City, which was designated as "evacuation-ready zone" after the Fukushima I Nuclear Power Plant accident. The Ministry also conducted the survey of the water. Maximum 27 becquerels/liter of radioactive cesium was detected in the water from a dam inside the "no-entry zone" [within 20-kilometer radius], but in most locations it was not detected. The Ministry's analysis is that "radioactive materials have been absorbed by sludge and sands and sunk to the bottom, and that is why the radiation density is high [in the soil in rivers, lakes and dams]." The survey result is not yet uploaded at the Ministry's website. GPS pattern recognition exercise by the Chinese military? A Google Maps satellite has spotted a series of bizarre structures during a sweep of the Gobi desert in China. The internet is buzzing with theories about what their purpose is, with suggestions ranging from giant QR readers to practise targets for military satellites. To add to the intrigue, they are located on the borders of Gansu province and Xinjiang in northwestern China - an area that the superpower uses to build military, space and nuclear equipment. Now They Tell Us: Cesium-137 Soil Deposition May Be Much Wider Than Thought, Hokkaido and Western Japan May Have "Hot Spots"
Not the news that weary radiation-vigilant residents of Japan (including Tokyo Brown Tabby) wanted to hear. But according to a new research paper by the international team of scientists to be published on the electronic version of the Proceedings of the National Academy of Sciences of the United States of America (PNAS), cesium-137 (half life 30 years) may have deposited in the soil in much wider areas including Hokkaido, Chubu, Chugoku, Shikoku in one month starting March 20. The cesium deposition in these regions is considered to be in much lower concentration than in Tohoku or Kanto, but the researchers say there may be radiation "hot spots" in these regions. It's no surprise to anyone who used to look at the dispersion simulations by Austria's ZAMG, Germany's DWD and Norway's NILU in the early days of the nuclear crisis in March, April and May. I remember seeing large plumes engulfing Hokkaido a number of times, and occasional small plumes swiping Shikoku. Of radioactive materials released from the Fukushima I Nuclear Power Plant accident, cesium-137, whose half life is 30 years, may have deposited in the soil in the mountains in Chubu and Shikoku regions, and Hokkaido, in a month starting March 20. It is a conclusion from the simulation done by the international team of scientists including those from the USRA (Universities Space Research Association), Nagoya University, and Tokyo University. Their paper will be published in the electronic version of the Proceedings of the National Academy of Sciences of the United States of America. It is assumed that most of these areas do not have the level of contamination that may affect the health or may require decontamination. However, there may be "hot spots" with locally high radiation, and a detailed investigation may be necessary, according to the scientists. Teppei Yasunari of USRA, Tetsuzo Yasunari of Nagoya University, and Ryugo Hayano of Tokyo University combined the global atmospheric transfer model (20-kilometer grid) developed in Norway, the meteorological data from European Centre for Medium-Range Weather Forecasts (ECMWF) [in Redding, UK] and radiation fallout measurement data from Japan's Ministry of Education and Science to do the simulation. According to their simulation, the cesium-137 deposition in Japan was estimated to be more than 1,000 terabecquerels in one month [starting March 20]. The simulation matched the result of the aerial survey by the Ministry of Education that showed the Pacific Ocean side of Tohoku and Kanto had a larger amount of cesium deposition. However, the simulation also shows that when the low pressures passed over the mountain areas in Chubu, Chugoku and Shikoku regions and in Hokkaido, wind that contained cesium-137 particles from Fukushima I Nuclear Power Plant may have blown and the particles may have fallen with the rain and deposited in the soil. ...we expect the true soil contamination across Japan to be considerably more variable than in our estimate. Even in regions where we find relatively low soil contamination levels, hot spots with high concentrations (e.g., due to convective rain fall, orographic enhancement of rainfall, or fine-grain soil flow by rainwater on the ground) may be possible. In contrast, relatively clean patches may also be present in areas with high overall contamination levels. "Movie S4. Estimated 137Cs concentration range in soil using DRT of 0.001 and conversion coefficient (CC) of 38, 53, and 68 kgm−2 over Japan. CCs of 38, 53, and 68 kgm−2 correspond to −1σ, mean value, and þ1σ in Fig. S5, respectively. Outputs 0.2° × 0.2° were interpolated into finer resolution using cubic interpolation. The Merged IBCAO/ETOPO5 Global Topographic Data Product (1) was used to mask out ocean area below 0 m above sea level (a.s.l.)." The movie can be seen here. Both photos were taken by the AP photographer David Guttenfelder. For more high impact photos, go to cryptome.org page, here. The Institute of Nuclear Power Operations (INPO) based in Atlanta, Georgia has issued the report on the early days of Fukushima I Nuclear Power Plant accident with overview and timeline of the accident. This report provides a narrative overview and timeline for the earthquake, tsunami, and subsequent nuclear accident at Tokyo Electric Power Company’s (TEPCO) Fukushima Daiichi Nuclear Power Station on March 11, 2011. The purpose of this report is to provide an accurate, consolidated source of information regarding the sequence of events that occurred in the first days of the accident. The information contained in this report may be used for determining future U.S. and international industry corrective actions. I haven't read it myself but feel free to report on it or any segment of it in the comment section. Iodine-131 in Europe: from Nuke Plant in Pakistan? ...In Poland, a spokesman for the atomic energy agency told AFP that the cause may lie in Pakistan, where officials were forced to repair a leak at the nearly 40-year-old Karachi Nuclear Power Plant (KANUPP) on October 19. According to the IAEA and the officials in the countries that have been detecting iodine-131, as long as the dose is minute and doesn't affect health, it's nothing to worry about. In the meantime, 17 people are dead from an accident at a weapons facility in Iran, including the commander in charge of Iran's nuclear missile development.